So I haven’t posted since Zoe’s birthday, just about two months ago now. My day basically goes like this: up, breakfast, shower, clothes, take Zoe to nursery, on to work, pick Zoe up from nursery, home, dinner, optional bath for Zoe, bedtime for Zoe, tidy the kitchen (slowly because I’m tired, with much checking of Facebook to get me through it), bed for me, move into Zoe’s room a couple of hours later, optional further wakings through the night. So I don’t seem to be able to find much time to post. But here’s a bunch of stuff she’s up to lately. She’s changed a lot since the last post. The big news is that she’s just started walking. 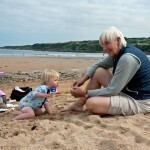 Last Thursday I arrived to collect her from nursery to see her take her first wobbly steps on her own! Since then she’s been wanting to practise constantly and is swiftly getting surer and faster. I suppose this makes her officially a toddler. 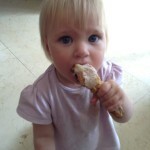 Zoe was particularly hungry on this day, and demolished most of this chicken leg for a snack. 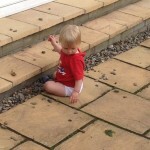 Pebbles on the patio still have their attractions. 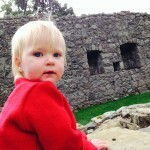 Grandma and Grandpa took Zoe to a castle. 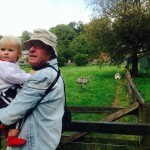 They also took Zoe to the wildlife park at Camperdown. 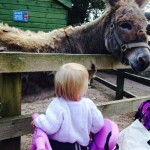 Zoe liked the donkey and did a good ‘ee-aww’. 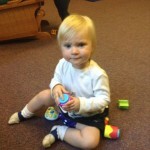 Zoe enjoys nursery. On the day this photo was taken she didn’t want to come home! 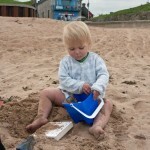 …and played in the sand. 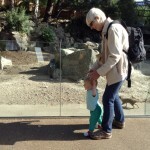 We went with Grandma and Grandpa to the zoo as well. 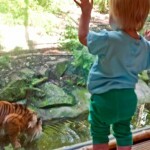 Zoe got a lovely view of this tiger (and his mate). 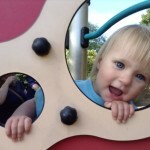 Lots of exciting animals at the zoo, but Zoe went straight for the playpark for a game of peekaboo! She can stretch up to things we thought were safely out of reach. And is irresistibly attracted to pulling the wine bottles from the wine rack. Possibly because she knows it’s a guaranteed way of getting parental attention. All meals are ‘dinner’. And demanded. Every bus, bicycle, dog, cat, and hat we pass in the street gets commented on with the appropriate sign or noise (eee-ah da’ for cat and uh uh for dog). In the absence of any of these she will talk about cats in the hope that one will appear. Or animals (nah-nee-ah) in general. She likes to look at plant catalogues, and they seem to be preferred potty reading. For some reason she is particularly fond of looking at pictures of onions. ‘Dunya’, she says. ‘Dunya!’ she protests when I turn the page to show the parsnips and peas. She said ‘dunya’ about the picture of figs as well for quite a while. I told her they were not onions but figs, and even bought her a fig so she could see, feel, and taste the difference. Now when she looks at the fig picture she shakes her head. ‘Da-dunya,’ she says sadly.